Carpet is the “third most expensive single item” in your home! Carpet maintenance and repair is important to extending the life of your carpet and rugs. Carpet repair comes in many forms. Carpet repair is often necessitated by small situations that have progressed into larger issues. For example, re-stretching may become necessary after buckles and ripples are noticed in your carpet. This is usually due to improper installation, though environmental factors may cause delamination, which will cause the carpet to appear rippled. Another repair option is a bonded insert, where a piece of carpet from a closet or remnant is inserted (like a skin graft) into an area of concern. This is particularly useful for small burns, concentrated areas of color loss, or catastrophic spills. We have access to the best carpet repairmen in North Carolina and can advise on your repair options. Managing your carpet’s appearance is accomplished by regularly removing dry particle soiling and prompt spot removal. If ground-in soil is not removed on a regular basis, traffic areas will wear excessively. Soil is extremely abrasive and attacks carpet at the fiber level. Moreover, “spots and spills” must be dealt with quickly before they become stains. Copies of specific warranties on your carpet purchase may be available from your carpet retailer. Warranties such as stain resist, wear, matting and crushing, etc. can vary considerably. However, all stain resistant warranties require regular cleaning and immediate spot removal! The following steps are necessary to maintain your carpet properly. 1. Shoe removal: The single most important step you can take to maintain any type of flooring is to remove your shoes before entering. If you consider all the soils, insecticides, pesticides, etc. that accumulate on your shoes, it just makes sense. Carpeting in homes where shoes are removed prior to entering are usually well-maintained. 2. Walk-Off Mats: Professional cleaning firms often stress the importance of removing soil before it enters your home. This is best accomplished by arranging walk-off mats in stages. Initial stages aggressively remove abrasive particle soil and final stages remove moisture. Choose matting that is easily cleaned so it stays on the job. Carefully consider proper equipment. Whole-house systems are best because they are easier to use, versatile, and exhaust outside the indoor environment. Next best are powerful up-rights with HEPA filtration. These are preferable to canister systems. Vacuum traffic areas thoroughly and concentrate on entry areas. Don’t neglect dust pockets under and behind furniture. 4. Professional Cleaning: As a general rule, professional cleaning by a reputable, certified firm should take place about once per year. For extremely heavy traffic areas- areas where children play, and/or areas where pets frequent- cleaning is required more often. Professional cleaning removes the damaging water and oil-based soil that vacuuming alone is not able to remove. 5. Spot Removal and Interim Cleaning: Immediate spot removal is key to a clean carpet. Great care must also be taken in how spot cleaning is performed. When a carpet is new, or has a sufficient protector on it, plain tap water will remove many spots. However, for those spots that will not remove easily with water, you must use a spot cleaner. Select a spot cleaner that is recommended by the carpet manufacturer or your trained, certified professional cleaner. Most spot removers that are purchased over the counter leave too much soap residue and can cause yellowing. Avoid using foam carpet cleaners or any product that is not made specifically for carpet. Apply spot cleaner sparingly to a clean, white terry cloth towel and gently massage the spot, causing it to transfer into the cloth. Never pour spot cleaner directly on your carpet. If the product that you are using seems to cause the spot to re-soil over a few weeks, discontinue use. Any spot that you are not able to remove, and for pet urine or feces, call your professional cleaner immediately. 6. Protective Coatings: Residential carpets are treated with stain resist properties and soil resistors. After a period of two to three years, some of the soil resistor wears off. 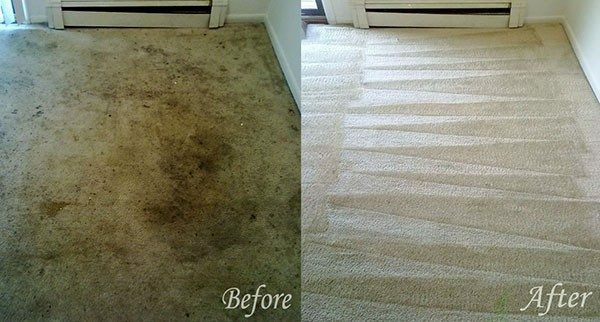 At that point, you should consider having a professional carpet cleaner re-apply the treatment after professional cleaning. The soil resistor will help soil slide off the carpet easier when vacuuming, spots will be easier to remove, and professional cleaning will be more effective. Pettyjohn’s carpet maintenance and repair services remove deep-seated soiling and spots that have accumulated between professional cleanings. We can find a solution to your specific cleaning needs through scheduled interval cleanings and appropriate cleaning methods. We take into account material, use conditions, regularity of cleaning, and other factors when developing a plan for your textile cleaning needs. Your carpets, rugs, upholstered furniture, and other fine textiles will be cared for by skilled professionals. Make it a point to have your carpets professionally cleaned and maintained regularly by a service provider that has performed carpet maintenance and repair for hundreds of satisfied customers. Pettyjohn’s treats every carpet, rug, and textile with Compassionate Expertise™. Our friendly staff are standing by to take your call and answer any questions you may have. You may also reach us via email through our Contact Us page.